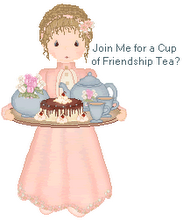 Friendship Tea: Are You Shopping On Black Friday? Have you seen these cute tea things at Hobby Lobby? I opted to stay home today with the grandchildren while the parents went bargain hunting! I do not like to shop in large crowds. And not in the middle of the nite!!!! Those are cool tea things. I didn't go to Mall of America on BF but I did go to SuperTarget. That wasn't so bad. I like to avoid the stores on Black Friday. You were wise to stay home with the children. No Hobby Lobby here in the northwest, as far as I know. I haven't seen these tea things at my local Hobby Lobby, but I will be taking another look. Thanks.